For body armour, see Body armor. For armoured forces, see armoured warfare. For other uses, see armour (disambiguation). Military vehicles are commonly armoured (or armored; see spelling differences) to withstand the impact of shrapnel, bullets, missiles or shells, protecting the personnel inside from enemy fire. 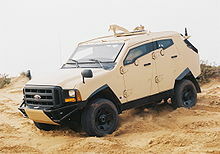 Such vehicles include armoured fighting vehicles like tanks, aircraft and ships. Civilian vehicles may also be armoured. These vehicles include cars used by officials (e.g., presidential limousines), reporters and others in conflict zones or where violent crime is common. Civilian armoured cars are also routinely used by security firms to carry money or valuables to reduce the risk of highway robbery or the hijacking of the cargo. Armour may also be used in vehicles to protect from threats other than a deliberate attack. Some spacecraft are equipped with specialised armour to protect them against impacts from micrometeoroids or fragments of space junk. Modern aircraft powered by jet engines usually have them fitted with a sort of armour in the form of an aramid composite kevlar bandage around the fan casing or debris containment walls built into the casing of their gas turbine engines to prevent injuries or airframe damage should the fan, compressor, or turbine blades break free. The design and purpose of the vehicle determines the amount of armour plating carried, as the plating is often very heavy and excessive amounts of armour restrict mobility. In order to decrease this problem, some new materials (nanomaterials) and material compositions are being researched which include buckypaper, and aluminium foam armour plates. Rolled homogeneous armour is strong, hard, and tough (does not shatter when struck with a fast, hard blow). Steel with these characteristics are produced by processing cast steel billets of appropriate size and then rolling them into plates of required thickness. Rolling and forging (hammering the steel when it is red hot) irons out the grain structure in the steel, removing imperfections which would reduce the strength of the steel. Rolling also elongates the grain structure in the steel to form long lines, which enable the stress the steel is placed under when loaded to flow throughout the metal, and not be concentrated in one area. Aluminium is used when light weight is a necessity. It is most commonly used on APCs and armoured cars. Wrought iron was used on ironclad warships. Early European iron armour consisted of 10 to 13 cm of wrought iron backed by up to one meter of solid wood. Titanium has almost twice the density of aluminium, but is as strong as iron. So, despite being more expensive, it finds an application in areas where weight is a concern, such as personal armour and military aviation. Some notable examples of its use include the USAF A-10 Thunderbolt II and the Soviet/Russian-built Sukhoi Su-25 ground-attack aircraft, utilising a bathtub-shaped titanium enclosure for the pilot, as well as the Soviet/Russian Mil Mi-24 attack helicopter. Because of its high density, depleted uranium can also be used in tank armour, sandwiched between sheets of steel armour plate. For instance, some late-production M1A1HA and M1A2 Abrams tanks built after 1998 have DU reinforcement as part of the armour plating in the front of the hull and the front of the turret, and there is a program to upgrade the rest (see Chobham armour). Plastic metal was a type of vehicle armour originally developed for merchant ships by the British Admiralty in 1940. The original composition was described as 50% clean granite of half-inch size, 43% of limestone mineral, and 7% of bitumen. It was typically applied in a layer two inches thick and backed by half an inch of steel. Plastic armour was highly effective at stopping armour piercing bullets because the hard granite particles would deflect the bullet, which would then lodge between plastic armour and the steel backing plate. Plastic armour could be applied by pouring it into a cavity formed by the steel backing plate and a temporary wooden form. Bulletproof glass is a colloquial term for glass that is particularly resistant to being penetrated when struck by bullets. The industry generally refers to it as bullet-resistant glass or transparent armour. Bullet-resistant glass is usually constructed using a strong but transparent material such as polycarbonate thermoplastic or by using layers of laminated glass. The desired result is a material with the appearance and light-transmitting behaviour of standard glass, which offers varying degrees of protection from small arms fire. The polycarbonate layer, usually consisting of products such as Armormax, Makroclear, Cyrolon, Lexan or Tuffak, is often sandwiched between layers of regular glass. The use of plastic in the laminate provides impact-resistance, such as physical assault with a hammer, an axe, etc. The plastic provides little in the way of bullet-resistance. The glass, which is much harder than plastic, flattens the bullet and thereby prevents penetration. This type of bullet-resistant glass is usually 70–75 mm (2.8–3.0 in) thick. Bullet-resistant glass constructed of laminated glass layers is built from glass sheets bonded together with polyvinyl butyral, polyurethane or ethylene-vinyl acetate. 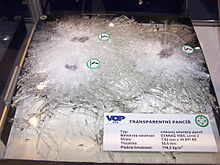 This type of bullet-resistant glass has been in regular use on combat vehicles since World War II; it is typically about 100–120 mm (3.9–4.7 in) thick and is usually extremely heavy. Newer materials are being developed. One such, aluminium oxynitride, is much lighter but at US$10–15 per square inch is much more costly. Ceramic's precise mechanism for defeating HEAT was uncovered in the 1980s. High speed photography showed that the ceramic material shatters as the HEAT round penetrates, the highly energetic fragments destroying the geometry of the metal jet generated by the hollow charge, greatly diminishing the penetration. Ceramic layers can also be used as part of composite armour solutions. The high hardness of some ceramic materials serves as a disruptor that shatters and spreads the kinetic energy of projectiles. Composite armour is armour consisting of layers of two or more materials with significantly different physical properties; steel and ceramics are the most common types of material in composite armour. Composite armour was initially developed in the 1940s, although it did not enter service until much later and the early examples are often ignored in the face of newer armour such as Chobham armour. Composite armour's effectiveness depends on its composition and may be effective against kinetic energy penetrators as well as shaped charge munitions; heavy metals are sometimes included specifically for protection from kinetic energy penetrators. Diagram of common elements of warship armour. The belt armour is denoted by "A". Belt armour is a layer of armour-plating outside the hull (watercraft) of warships, typically on battleships, battlecruisers, cruisers and some aircraft carriers. Typically, the belt covered from the deck down someway below the waterline of the ship. 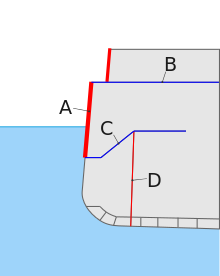 If built within the hull, rather than forming the outer hull, it could be fitted at an inclined angle to improve the protection. When struck by a shell or torpedo, the belt armour is designed to prevent penetration, by either being too thick for the warhead to penetrate, or sloped to a degree that would deflect either projectile. Often, the main belt armour was supplemented with a torpedo bulkhead spaced several meters behind the main belt, designed to maintain the ship's watertight integrity even if the main belt were penetrated. The air-space between the belt and the hull also adds buoyancy. Several wartime vessels had belt armour that was thinner or shallower than was desirable, to speed production and conserve resources. Armour plating is not common on aircraft, which generally rely on their speed and manoeuvrability to avoid ground fire, rather than trying to resist impacts. Additionally, any armour capable of stopping large-calibre anti-aircraft fire or missile fragments would result in an unacceptable weight penalty. So, only the vital parts of an aircraft, such as the ejection seat and engines, are usually armoured. This is one area where titanium is used extensively as armour plating. For example, in the American Fairchild Republic A-10 Thunderbolt II and the Soviet-built Sukhoi Su-25 ground attack aircraft, as well as the Mil Mi-24 Hind ground-attack helicopter, the pilot sits in a titanium enclosure known as the "bathtub" for its shape. In addition, the windscreens of larger aircraft are generally made of impact-resistant, laminated materials, even on civilian craft, to prevent damage from bird strikes or other debris. The most heavily armoured vehicles today are the main battle tanks, which are the spearhead of the ground forces, and are designed to withstand anti-tank missiles, kinetic energy penetrators, NBC threats and in some tanks even steep-trajectory shells. The Israeli Merkava tanks were designed in a way that each tank component functions as additional back-up armour to protect the crew. Outer armour is modular and enables quick replacement of damaged armour. For efficiency, the heaviest armour on an armoured fighting vehicle (AFV) is placed on its front. Tank tactics require the vehicle to always face the likely direction of enemy fire as much as possible, even in defence or withdrawal operations. Sloping and curving armour can both increase its protection. Given a fixed thickness of armour plate, a projectile striking at an angle must penetrate more armour than one impacting perpendicularly. An angled surface also increases the chance of deflecting a projectile. This can be seen on v-hull designs, which direct the force of an Improvised explosive device or landmine away from the crew compartment, increasing crew survivability. Beginning during the Cold War, many AFVs have spall liners inside of the armour, designed to protect crew and equipment inside from fragmentation (spalling) released from the impact of enemy shells, especially high explosive squash head warheads. Spall liners are made of Kevlar, Dyneema, Spectra Shield, or similar materials. Appliqué armour, or add-on armour, consists of extra plates mounted onto the hull or turret of an AFV. The plates can be made of any material and are designed to be retrofitted to an AFV to withstand weapons that can penetrate the original armour of the vehicle. An advantage of appliqué armour is the possibility to tailor the vehicle's protection level to a specific threat scenario. Vehicle armour is sometimes improvised in the midst of an armed conflict by vehicle crews or individual units. In World War II, British, Canadian and Polish tank crews welded spare strips of tank track to the hulls of their Sherman tanks. U.S. tank crews often added sand bags in the hull and turrets on Sherman tanks, often in an elaborate cage made of girders. Some Sherman tanks were up-armoured in the field with glacis plates and other armour cut from knocked-out tanks to create Improvised Jumbos, named after the heavily armoured M4A3E2 assault tank. In the Vietnam War, U.S. "gun trucks" were armoured with sandbags and locally fabricated steel armour plate. More recently, U.S. troops in Iraq armoured Humvees and various military transport vehicles with scrap materials: this came to be known as "hillbilly armor" or "haji armor" by the Americans. Moreover there was the Killdozer incident, with the modified bulldozer being armored with steel and concrete composite, which proved to be highly resistant to small arms. Sturmgeschütz III with spaced armour plates. Armour with two or more plates spaced a distance apart, called spaced armour, has been in use since the First World War, where it was used on the Schneider CA1 and Saint-Chamond tanks. Spaced armour can be advantageous in several situations. For example, it can reduce the effectiveness of kinetic energy penetrators because the interaction with each plate can cause the round to tumble, deflect, deform, or disintegrate. This effect can be enhanced when the armour is sloped. Spaced armour can also offer increased protection against HEAT projectiles. This occurs because the shaped charge warhead can detonate prematurely (at the first surface), so that the metal jet that is produced dissipates its energy before reaching the main armour. Sometimes the interior surfaces of these hollow cavities are sloped, presenting angles to the anticipated path of the shaped charge's jet in order to further dissipate its power. Taken to the extreme, relatively thin armour plates, metal mesh, or slatted plates, much lighter than fully protective armour, can be attached as side skirts or turret skirts to provide additional protection against such weapons. This can be seen in middle and late-World War II German tanks, as well as many modern AFVs. Taken as a whole, spaced armour can provide significantly increased protection while saving weight. The analogous Whipple shield uses the principle of spaced armour to protect spacecraft from the impacts of very fast micrometeoroids. The impact with the first wall melts or breaks up the incoming particle, causing fragments to be spread over a wider area when striking the subsequent walls. Sloped armour is armour that is mounted at a non-vertical and non-horizontal angle, typically on tanks and other armoured fighting vehicles. For a given normal to the surface of the armour, its plate thickness, increasing armour slope improves the armour's level of protection by increasing the thickness measured on a horizontal plane, while for a given area density of the armour the protection can be either increased or reduced by other sloping effects, depending on the armour materials used and the qualities of the projectile hitting it. The increased protection caused by increasing the slope while keeping the plate thickness constant, is due to a proportional increase of area density and thus mass, and thus offers no weight benefit. Therefore, the other possible effects of sloping, such as deflection, deforming and ricochet of a projectile, have been the reasons to apply sloped armour in armoured vehicles design. Another motive is the fact that sloping armour is a more efficient way of covering the necessary equipment since it encloses less volume with less material. The sharpest angles are usually seen on the frontal glacis plate, both as it is the hull side most likely to be hit and because there is more room to slope in the longitudinal direction of a vehicle. Explosive reactive armour, initially developed by German researcher Manfred Held while working in Israel, uses layers of high explosive sandwiched between steel plates. When a shaped-charge warhead hits, the explosive detonates and pushes the steel plates into the warhead, disrupting the flow of the charge's liquid metal penetrator (usually copper at around 500 degrees Celsius; it can be made to flow like water by sufficient pressure). Traditional "light" ERA is less effective against kinetic penetrators. "Heavy" reactive armour, however, offers better protection. The only example currently in widespread service is Russian Kontakt-5. Explosive reactive armour poses a threat to friendly troops near the vehicle. Non-explosive reactive armour is an advanced spaced armour which uses materials which change their geometry so as to increase protection under the stress of impact. Active protection systems use a sensor to detect an incoming projectile and explosively launch a counter-projectile into its path. 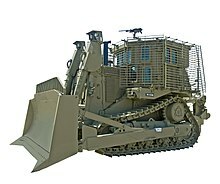 IDF Caterpillar D9 armoured bulldozer with slat armour (in addition to armour plates and bulletproof windows). The D9 armour deflected RPG rockets and even 9K11 Malyutka (AT-3 Sagger) ATGMs. Slat armour is designed to protect against anti-tank rocket and missile attacks, where the warhead is a shaped charge. The slats are spaced so that the warhead is either partially deformed before detonating, or the fuzing mechanism is damaged, thereby preventing detonation entirely. As shaped charges rely on very specific structure to create a jet of hot metal, any disruption to this structure greatly reduces the effectiveness of the warhead. Slat armour can be defeated by tandem-charge designs such as the RPG-27 and RPG-29. Electrically charged armour is a recent development in the United Kingdom by the Defence Science and Technology Laboratory. A vehicle is fitted with two thin shells, separated by insulating material. The outer shell holds an enormous electric charge, while the inner shell is at ground. If an incoming HEAT jet penetrates the outer shell and forms a bridge between the shells, the electrical energy discharges through the jet, disrupting it. Trials have so far been extremely promising, and it is hoped that improved systems could protect against KE penetrators. The developers of the Future Rapid Effect System (FRES) series of armoured vehicles are considering this technology. ^ "Containment Device | Transport Armor : Pinnacle Armor – Body Armor and Armoring Products". Pinnacle Armor. Archived from the original on September 28, 2011. Retrieved 2012-01-29. ^ "Buckypaper armour". Slipperybrick.com. 2008-10-19. Archived from the original on 2012-02-17. Retrieved 2012-01-29. ^ "Lightweight aluminum foam armour plates". Ntnu.no. Archived from the original on 2012-09-05. Retrieved 2012-01-29. ^ Thomas, Daniel J. (2016-10-01). "Laser cut hole matrices in novel armour plate steel for appliqué battlefield vehicle protection". Defence Technology. 12 (5): 351–359. doi:10.1016/j.dt.2016.07.002. ISSN 2214-9147. ^ Katzman, Joe (2007-04-26). "In Praise of Senator Biden: Survivable Rides for the Troops". Winds of Change.NET. Archived from the original on 2008-05-18. Retrieved 2012-01-29. ^ Oxford English Dictionary "appliqué, n. and adj: "Ornamental needlework in which small decorative pieces of fabric are sewn or stuck on to a fabric or garment to form a pattern or trim; the practice of this as a technique or activity; (also) (a piece of) decoration or trim made in this way. Also in extended use in metalwork, and fig". adj. "Of fabric or a garment: decorated by sewing or sticking on small pieces of fabric to form a pattern or trim; (of decoration, trim, etc.) attached in this way". ^ Gary W. Cooke Combat Vehicle Protection Archived 2009-02-04 at the Wayback Machine 1 August 2004. cites "FM 3-22.34 TOW Weapon System." and "FM 5-103 Survivability." ^ a b Moran, Michael. "Frantically, the Army tries to armour Humvees: Soft-skinned workhorses turning into death traps," Archived 2006-06-18 at the Wayback Machine MSNBC, April 15, 2004. ^ "Slat Armour for Stryker". Defense-update.com. Archived from the original on 2012-01-30. Retrieved 2012-01-29. ^ "BAE's LROD Cage Armor". Defenseindustrydaily.com. 2011-03-15. Archived from the original on 2012-01-29. Retrieved 2012-01-29. ^ "'Electric armour' vaporises anti-tank grenades and shells". Archived from the original on 2008-04-23. Retrieved 2018-11-18. ^ "New Age Electric Armour – Tough enough to face modern threats". Armedforces-int.com. Archived from the original on 2009-05-02. Retrieved 2012-01-29. ^ "Add-On – Reactive Armor Suits". Defense-update.com. 2006-04-25. Archived from the original on 2012-01-26. Retrieved 2012-01-29. ^ "Advanced Add-on Armor for Light Vehicles". Defense-update.com. 2006-04-25. Archived from the original on 2007-10-15. Retrieved 2012-01-29.